I can’t believe how easy and effective these infused water recipes are! They support healthy detox function 2 fold: you’ll drink more water since it tastes so good, and you’ll boost your consumption of detoxifying fruits, veggies, and herbs. Did you know an appropriate intake of water daily is crucial for supporting your detoxification pathways? A general rule of thumb is to drink about half of your body weight in ounces, but this is just a starting point for customization. Be mindful of how much water you need to consume in order to feel your best. 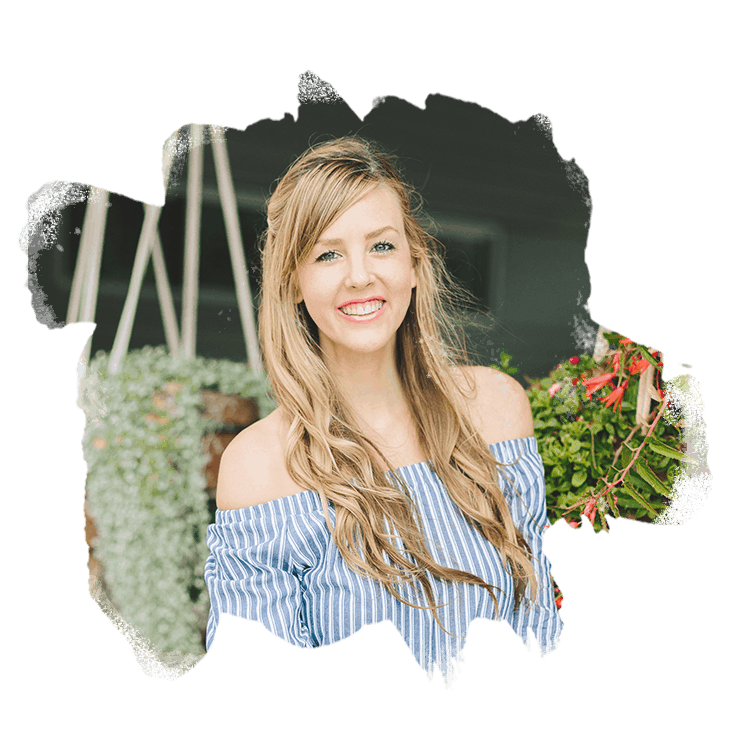 Good news for you… I have a secret way for you to spice up that water so you’re helping your body to detox while also delighting your taste buds. Hint: it’s these infused water recipes! 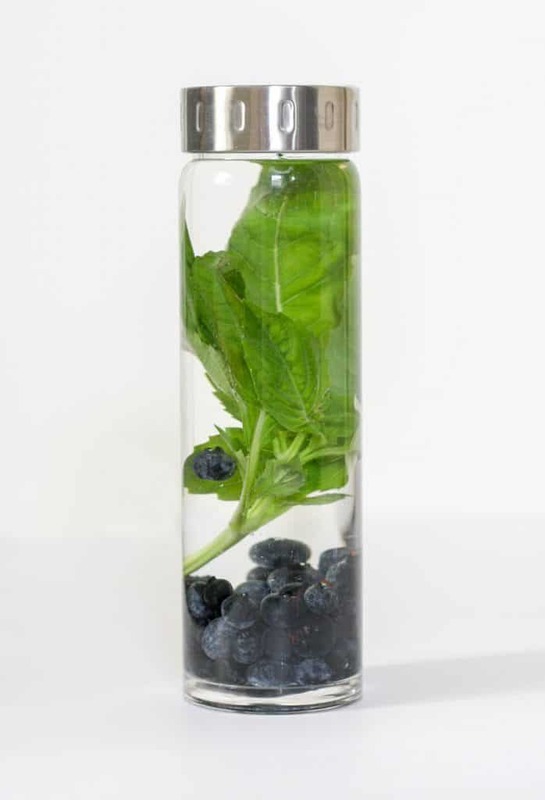 To make infused water, all you need is filtered water, fruit, veggies, and/or herbs. Makes it sound so simple, right? It is! Today I’m sharing 4 of my favorite combinations for not only adding flavor to your water, but also provide a plethora of detox benefits. Read on, my friend. 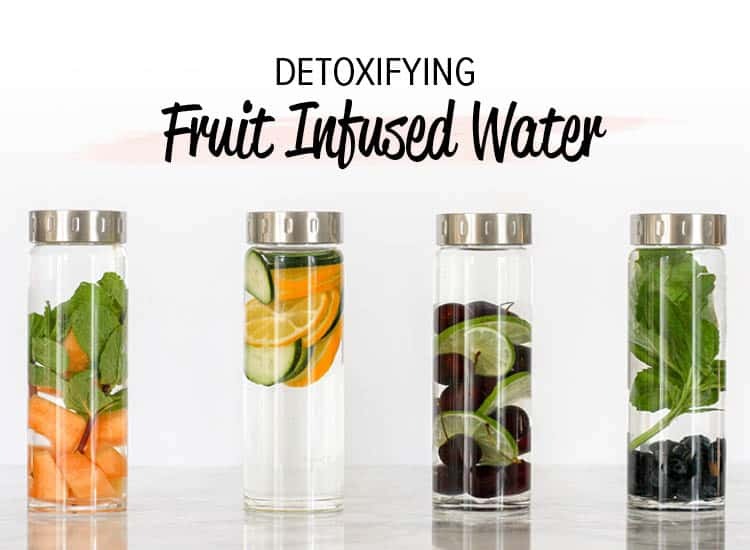 How do these infused water recipes help you to detox? Each recipe includes it’s own combination of fruits, veggies and herbs that provide detoxifying benefits. Some of the ingredients are inherently detoxifying, while others provide fiber and antioxidants. 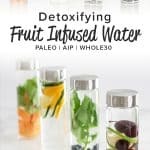 Let’s dive into each infused water recipe combination, and the detoxifying benefits provided from the ingredients. Blueberries are a detox superfood due to their high antioxidant and fiber content. A perfectly detoxifying duo. Basil is an antioxidant rich herb that helps to break the free radical chain reaction in the body, reducing overall oxidative stress. Fiber, antioxidants, electrolytes – cantaloupe has plenty of factors to help keep your lymphatic fluid hydrated and flowing. Mint leaves are thought to increase bile secretion and encourage bile flow – two important components of detoxification. Just like blueberries, cherries are a good source of antioxidants and fiber. They’re also a great source of melatonin. Melatonin can have a positive impact on the quality of your sleep, which makes this my favorite infused water recipe to sip after dinner. Pectin is a naturally occurring chemical that helps to chelate toxins from the body. Since pectin in limes and other citrus fruits is found to be high in the rinds and pith, you’ll want to infuse your water with whole lime slices instead of simply squeezing the lime juice into your water. Cucumbers are high in antioxidants, and also help keep your body hydrated and lymphatic system flowing. In addition to the pectin in the rinds and pith, the juice of the lemon gives you a boost of vitamin c. This water soluble vitamin acts as a chelating agent to bind to and remove toxins from the body. It also works to thin the bile, which allows your liver to function more efficiently. 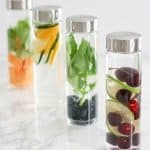 How do I make infused water? 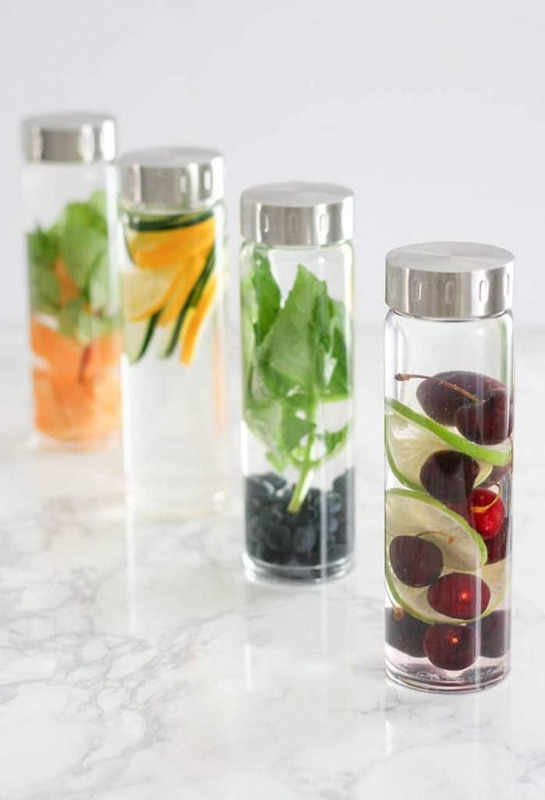 Making any of these infused water recipes is so simple: wash and chop or slice your produce, then add to cool, filtered water for a few hours or overnight. That’s it! The recipes I provide below include quantities for each ingredient, but these are just a starting point. You can add more or less based on how strong you like the flavor. If you end up making it stronger than you like, you can use it as a “concentrate”, and add additional water to dilute the flavor. You can allow the produce to infuse the water for as little as 2 hours, but you’ll want to keep it in the fridge if you choose to infuse it longer than this. If you don’t refrigerate your infused water, you can run the risk of bacteria developing. 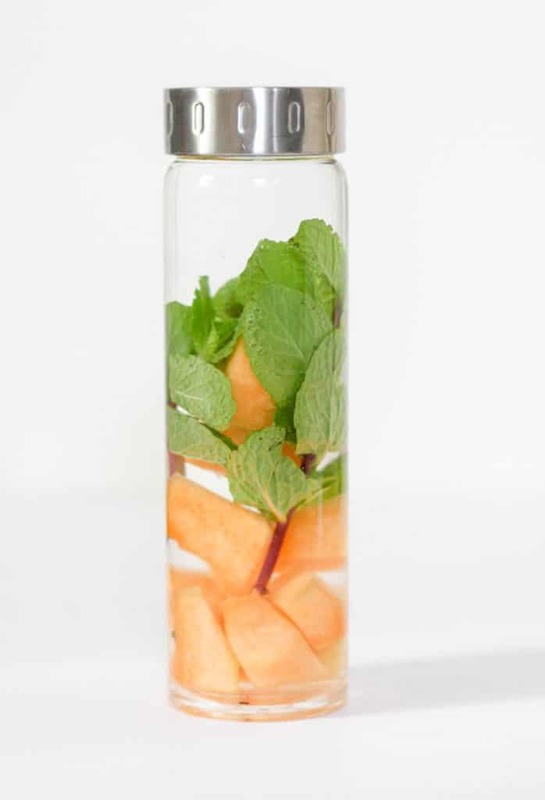 Can I eat the produce in my infused water recipes? So long as it hasn’t been left out at room temperature too long, the answer is yes! Word to the wise: after about 2 hours at room temp you’ll run the risk of bacteria developing. I keep my bottle in the fridge and just continue to pour a glass throughout the day. If you choose to eat the produce after you drink your infused water, you’ll notice the fruits and veggies aren’t as flavorful as they would be if they hadn’t been infused. This is due to the juices infusing your water. From a detox perspective, it’s worth it to still eat the produce. That way you’ll get all the fiber from those fruits and veggies. Lymphatic Elixir – aka. your daily detox drink! Apple Cider Vinegar Shots – that actually taste good! 10 Minute Detox – an activated charcoal + dry skin brushing trick! These fruit infused water recipes are so easy and effective! They help support healthy detox function and taste delicious and refreshing. 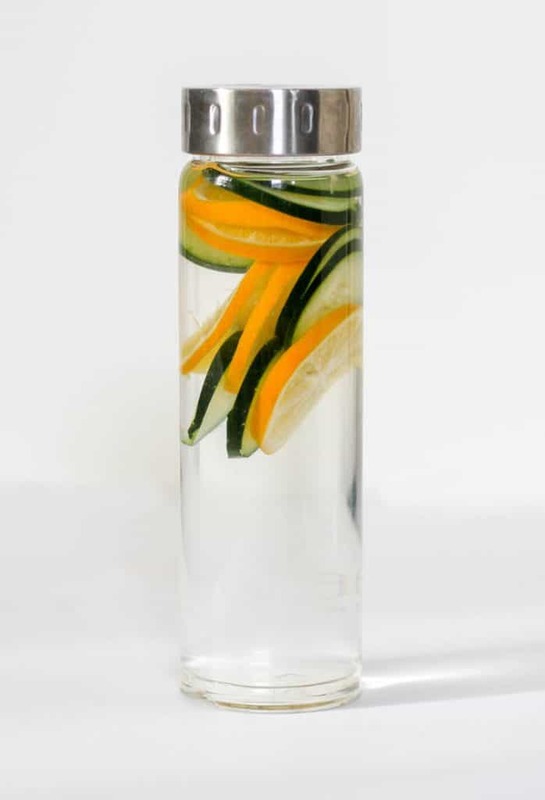 Combine the ingredients with the water in a glass container, and store in the fridge for at least 2 hours, ideally overnight, to allow the water to infuse. For more flavor, you can muddle the berries. Slice the lime. Combine the ingredients with the water in a glass container, and store in the fridge for at least 2 hours, ideally overnight, to allow the water to infuse. 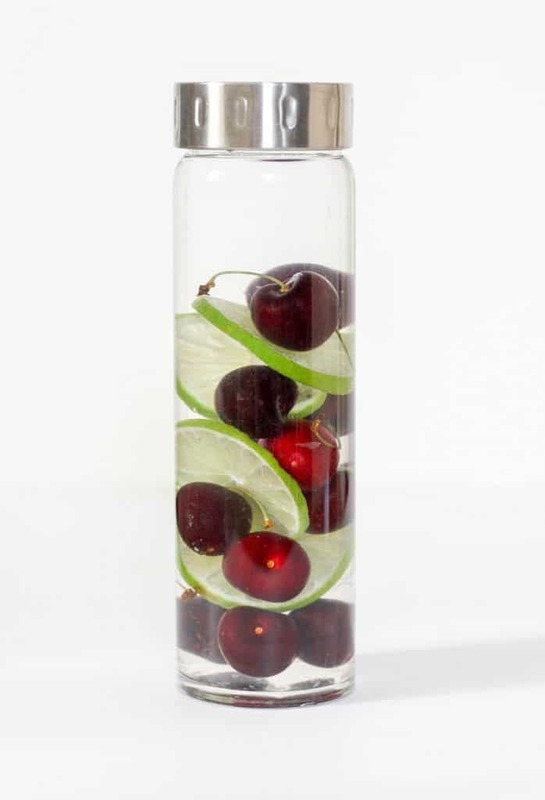 For more flavor, you can slice or muddle the cherries. Chop cantaloupe. Combine the ingredients with the water in a glass container, and store in the fridge for at least 2 hours, ideally overnight, to allow the water to infuse. For more flavor, you can muddle the mint. Slice cucumbers and lemon. Add ingredients to water in a glass container, and store in the fridge for at least 2 hours, ideally overnight, to allow the water to infuse. Thank you for including the info about not leaving the infused water out! Since I’ve been eating more whole foods without preservatives I’ve been kinda paranoid about bacteria developing so I appreciate your attention to food safety!